From now until May 1st, in the first-person shooter/dating simulator Overwatch, you can defend the Londonesque King’s Row map from waves of rogue robots as part of the game’s “Uprising” event. 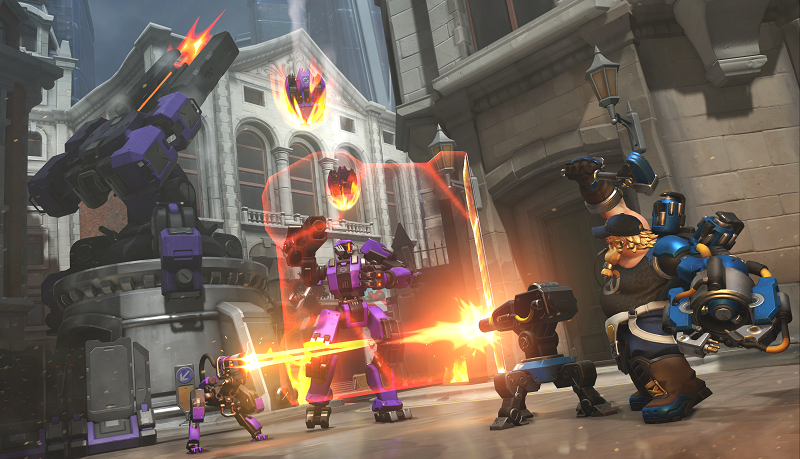 It’s the second co-op brawl mode the Overwatch team has tried out, and it is killer. After Overwatch’s co-op Halloween event, I had low hopes for this mode. “Junkenstein’s Revenge” was a PvE horde mode in which an onslaught of robots, plus some evil heroes, closed in on four players. Sure, it was supposed to be corny, but it also felt stagnant. I watched some videos where players barely moved the whole time. Players were even locked into a pre-fixed hero composition. It didn’t take advantage of what Overwatch could offer on the PvE front: involved maps, dynamic combat and an impetus to work together. “Uprising” learned a lot from what I consider shortcomings of “Junkenstein’s Revenge.” It’s kinetic, one of Overwatch’s best qualities, taking place across the map rather than keeping players rooted to one spot. “Uprising” relives Tracer’s first mission, seven years before the events of Overwatch, when she and an elite strike team quelled a robot uprising and liberated her home. Tracer, Torbjorn, Reinhardt and Mercy navigate the sprawling, hybrid King’s Row map, retaking strategic points and defending and then moving a payload. Over an intercom, the heroes Ana and (pre-evil?) Reaper guide you. Throughout, a variety of robots close in from all sides. Some attack the payload. Others hide behind shields. The most fun to take down are Bastions and OR-14s, or proto-Orisas. When you die, other players can resurrect you by standing over your corpse. I died once or twice in “Normal” mode as Tracer. In “Hard” mode, which I recommend, strategy is crucial, or you’ll die a lot more. Players must call out where Bastions set up or risk getting mowed down. Mercy must alternate between damage boosting and healing. Reportedly, “Legendary Mode” is near-impossible. Each game lasts about 10 to 15 minutes. “Uprising” shows off Overwatch’s PvE potential. Payload and control point maps are what the game’s all about, and on the hybrid King’s Row map, “Uprising” takes full advantage of its environment. The pre-selected team comprised of a DPS, defense, tank and healer is perfectly balanced. Each enemy calls for a different takedown strategy, especially at higher difficulties. When a mini-boss spawns in front of Tracer, Reinhardt had better tackle it. Players need to support each other—over the intercom, Ana says as much when she jokes that Reinhardt better not to charge in on his own. Because of the mode’s stress on teamwork, there’s nearly no downtime. You get into a state of flow, a feeling reminiscent of early first-person shooters’ campaign modes. There’s also a version of “Uprising” where you can choose any four heroes, but it lacks the tension of the predetermined heroes. If nobody opts to heal—and let’s be honest, that’s very likely—you will die, a lot. That’s a good thing. Overwatch does what it can to make sure players adjust to the needs of their team. If your teammates insta-lock two snipers, it might be good to pick a tank or a healer. Selfishness is a very, very bad quality for serious players. Uprising is not easy, and for the team to stay alive and competitive, players must be empathetic to each other’s needs. “Uprising” repurposes what makes Overwatch great into a polished, self-contained campaign. Slicer robots use a variation of Zarya’s beam attack. King’s Row’s labyrinthine design adds some intrigue to the “hacks” players must pull off to take control points. The inclusion of Bastions and Orisa’s prototypes as mobs reminds players that, at one point, these robots were the enemy. A slew of new voice lines, establishing a cute antagonism between Torbjorn and Mercy, add color. It feels like you’re actually playing the lore. But if you’re not into that, you can skip the story—it’s still a great time.